We urge the UNFCCC Conference of Parties to heed the 2013-2015 Review into the adequacy of the current long-term temperature goal of holding global warming below a 2 degrees Celsius increase above preindustrial levels, inclusive of the Structured Expert Dialogues and Lima-invited submissions of parties, and insist that immediate measures to strengthen the goal to the below 1.5 degrees Celsius target are indispensable to the integrity of the ultimate objective of the UNFCCC, the survival of a number of our nations, and the prosperity of our populations, people everywhere, and the world. We also draw attention to our #1o5C campaign and call on all nations to seize the COP21 opportunity for a climate-secure framework that keeps warming below 1.5°C. A commitment by all Parties to catalysing low-emission and climate resilient investments at domestic and international levels with a view to eliminating high-carbon investments and harmful subsidies, including through enhancing enabling environments both at the international and national levels so as to decarbonise the global economy rapidly. Adaptation needs are inseparable from the long-term goal. The approximately 3-degrees of warming that current commitments have the world on track for will require enormous adaptation efforts compared with current needs. Holding the rise in temperatures below 1.5°C reduces adaptation costs significantly even if major additional efforts are already required simply to manage impacts associated with the current 0.75-0.85°C degrees of warming. Developing countries are already leading the design of adaptation plans as reflected in the INDCs submitted in 2015. The Paris agreement can make a difference on the ground if it supports the implementation of these proactive adaptation actions, and further efforts to lead by example. Insufficient responses to climate change whether mitigation, adaptation, finance, capacity building, technology transfer or otherwise do result in significant unavoidable losses and damages every day, both of an economic and non-economic nature, with these increasing in tandem with additional warming. The continuation and strengthening of the UNFCCC’s work on loss and damage, appropriately integrated within the Paris agreement, is therefore fundamentally important and is also useful for informing and galvanizing response decisions, particularly on mitigation and adaptation, to promote understanding of community challenges and needs of vulnerable populations, and to establish options for compensating affected populations, which should be measured with a human rights-based approach. Initiate a process to address losses and damages from climate change including raising financing for loss and damage. In light of current emission commitments of parties to the UNFCCC amounting to approximately 3°C of warming, we agreed to strengthen our own national climate actions in order to: lead processes to help trigger increased commitments from all countries for urgent progress towards the goal of below 1.5°C. We recognize that our INDCs towards achieving the UNFCCC objective of preventing dangerous anthropogenic interference with the climate system are the appropriate means to convey any upscaled commitments and emphasized that additional enabling support on means of implementation would be indispensable to any upscaled mitigation action by CVF countries;Adopt climate actions at the national, regional and global levels, in accordance with national priorities and challenges, to effectively address all aspects of climate change, i.e. mitigation and adaptation; and calling for adequate support to the CVF countries in terms of finance, capacity building and technology development and transfer;Pursue sustainable development strategies and actions now that will move toward climate-resilient pathways while at the same time help to improve livelihoods, social development, and economic well-being, especially for communities most vulnerable to the impacts of climate change;Building on existing actions by national and local government and civil society, commit to continue support to communities most vulnerable to the impacts of climate change through increased Community Based Adaptation. Develop and implement new, improved and innovative approaches; and engage in advocacy and other joint actions. Develop and disseminate and ensure effective use of new climate information and knowledge products by users critical to effective responses to climate change in accordance with Forum priorities. We urge the international community, and in particular higher capacity countries who have more influence on the state of our climate, to seize this opportunity for a new approach to collaborative and transboundary climate action to support our climate agenda by upscaling the existing contributions towards the new global climate change regime, as well as other forms of assistance for the realization of these our aspirations, priorities and interests as outlined in this Declaration. –Increasing the speed and efficiency by which scarce resources to support urgent national climate change priorities and concerns can be accessed, free of conditionality and facilitated through direct access, including via the Green Climate Fund. Addressing the major imbalance of availability of existing technological means and expertise that could provide grounds for much expanded and mutually beneficial climate action worldwide through significantly accelerated progress towards realizing steady transfers and exchanges of technology, North-South and South-South, and by stimulating efforts for the technology development activities of developing countries. Decide to collaborate for further progress in the development at international level of enhanced responses to climate change, to catalyse action by the international community, and promote and deploy programmatic responses with respect to the following sectors independent of and in complement to the UNFCCC and its role as the primary fora for the international response to climate change as a continuation of the Costa Rica Action Plan’s focus on health, human rights, labour, migration/displacement and science, while expanding our focus to the following new domains: agriculture, education, gender, tourism and water. Agree to establish one or more task forces/committees to take forward the work in these priority areas outlined. Decide to pursue the activities as contained in the 2016-18 Road Map annexed to this Declaration. Confirm all new states endorsing this Declaration as member states of this Forum and invite other most vulnerable developing countries to endorse this Declaration and join in our Forum in accordance with the body’s Operational Modalities. Express deep appreciation to Philippines for its leadership of the Forum process and hosting of the Manila meeting and to Costa Rica, the previous Chair, and Bangladesh, the other member of Troika coordination hub, and convey full support to the Forum presidency and members of the Troika as they strive to represent and advance our common interests. Confirm the Ethiopia as the Forum’s next Chair for the 2016-17 period. Further to recent changes in the United Nations Development Group guidance for trust funds of critical importance to CVF resourcing, endorse the guidance on capitalization of the Forum’s Trust Fund annexed to this Declaration, while extending deep appreciation and recognition to all members and other donors that have supported this body’s Trust Fund, initiated through a special financial contribution from Bangladesh, acting then in its capacity as Chair, and to the United Nations Development Programme for administering the instrument, while inviting and encouraging further contributions to the Fund. Instruct the ad hoc Secretariat to design a strategy for fundraising to present for consideration, endorsement and implementation by the CVF members in order to enable each country to effectively interact with donors and funding institutions at bilateral and multilateral levels in order to build stronger and more sustainable funding partnerships for the Forum’s work and Trust Fund. 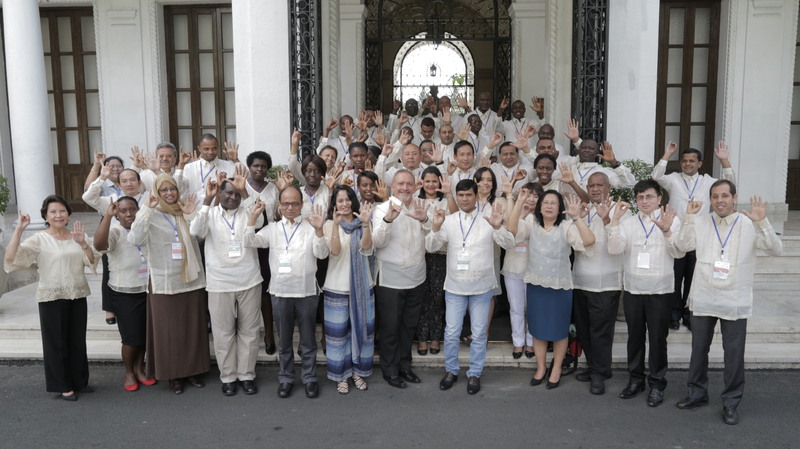 Photo: CVF country delegates celebrate the adoption of The Manila Communique on the steps of the presidential palace of the Philippines and perform the new #1o5C campaign hand gesture. Source: CVF/CCCPh License: CC.